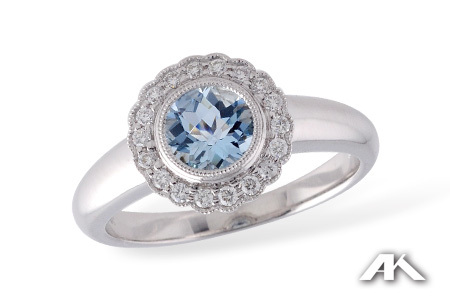 A Halo of Diamonds surrounding a soft, blue Aquamarine in a 14k white gold ring. Whose eyes would match this soft blue color? Pale blue sparkles at the center of this ring. A halo of round diamonds with scalloped and milgrained edges lends a sense of elegance to this wonderful peice. The bezel set center and a strong shank ensure that you will love and wear this piece for many years to come.